Lower back pain is very common and affects many people at some point in their lives. Our physiotherapists at Platinum Physiotherapy provide specialist assessment and treatment for people with lower back problems and use a variety of treatment techniques to help this condition. An initial assessment will see how your current problem is affecting your everyday activities. Individualised treatment goals will then be formulated between you and your physiotherapist with reference to the findings during the assessment. Your physiotherapist will also advise you on exercise, pacing, reduction in aggravating factors and pain medication to reduce any anxiety and make sure you get the most out of your treatment. Many people with lower back problems benefit from physiotherapy and go on to make significant long term improvements. Physiotherapy treatment will help you manage your pain, improve your strength and flexibility and facilitate your recovery. Acute low back pain is usually of sudden onset and is often triggered by a relatively minor movement such as bending to pick up an object. Acute or short-term low back pain generally lasts from a few days to a few weeks. People with chronic low back pain may also have acute episodes that may become more frequent and require less initiation over time. What causes acute low back pain? Most acute back pain is mechanical in nature which means it is caused by trauma to the lower back or a disorder such as arthritis. Pain from trauma may be caused by a sports injury, work around the house or in the garden, or a sudden jolt such as a car accident that place stress on spinal bones and tissues. What are the effects/symptoms of acute low back pain? A person with initially experience sharp pain which may develop over a period of hours due to the development of inflammation. The pain is usually in the lower lumbar area and may be central, to both sides, or to one side. It may radiate to the buttocks, hamstrings or lower leg. Sharp, stabbing pain in a narrow band down the leg is radicular pain and is associated with nerve root irritation, sometimes as a result of a ‘slipped disc’. More commonly, the pain the patient feels in the buttock and hamstring is referred from the lumbar spine. A person with acute low back pain will benefit from physiotherapy treatment. Our physiotherapists at Platinum Physiotherapy provide specialised physiotherapy treatment to reduce pain and inflammation and return you to your everyday activities with confidence and success. Individualised back exercise program. As your symptoms resolve, your physiotherapist can teach you progressive stretching, strengthening and core stability exercises to minimise the risk of a reoccurrence. It is important to commence physiotherapy treatment as soon as possible after your injury for the best possible results. What is a back strain? A back strain or ‘pulled’ muscle in the lower back is a frequent source of back pain characterised by stretching of tearing of a muscle. What causes a back strain? A back strain can be caused by strenuous activity like lifting a heavy object in an incorrect manner by bending the back rather than the knees, sharp sudden twisting movements, or even due to standing for long periods of time. The spine is held upright by muscles and ligaments and the over-stretching or tearing of these muscles can occur if the muscle suddenly contracts or is stretched too far. When a back strain or sprain occurs, there is inflammation of the soft tissue that causes pain and possibly back spasms. Back strains and sprains can also be caused by poor posture, poor muscle tone in the back and abdomen, emotional stress or excessive weight or pregnancy. What are the symptoms/effects of a back strain? People with a back strain frequently feel pain that can appear either side of the back or in the upper buttocks and can get worse with muscle spasms as they occur. It is important to consult a physiotherapist following your injury hasten your recovery and for the best possible outcome. At Platinum Physiotherapy, we provide individualised physiotherapy treatment which will facilitate healing, reduce pain and stiffness and get you back to work and your hobbies sooner. Your physiotherapist will initially assess your current symptoms, range of movement, muscle strength and function in order to develop a progressive rehabilitation program. Progressive and individualised exercise program, for the abdominal or ‘core’ muscles and back muscles to increase strength and stability of the spine. Physiotherapy treatment will hasten the recovery process and get you back to the daily and sporting activities you enjoy as quickly as possible. A disk prolapse, or ‘slipped disk’, occurs when the thick paste-like disc nucleus is pushed out through a tiny defect in the fibrous disc wall. This bulge of nucleus can irritate the nerve root causing pain, which may radiate down the leg. What causes a disc prolapse? A disc prolapse usually occurs when pressure is placed on the spine when lifting a heavy object in the wrong way. A direct injury such as a fall or a whiplash accident can cause a disc prolapse. What are the symptoms/effects of a disc prolapse? People with a disc prolapse typically present with acute low back pain and/or leg pain following a relatively trivial movement usually involving bending forward. Pain is often aggravated by sitting, bending, lifting, coughing and sneezing. Pain is usually eased by lying down, particularly on the non-painful side, and is often less in the morning after a nights rest. Physiotherapy treatment is very effective at reducing pain and stiffness and improving muscles strength and flexible following a disc prolapse. Your physiotherapist at Platinum Physiotherapy will develop an individually tailored exercise plan for you to relieve pain, keep you strong and flexible and help prevent any further damage being caused to your back. Back exercise program including strengthening and stretching exercises to restore normal pain-free movement to the area and stabilise the spine. Your physiotherapist will support your through your exercise program to ensure you are maintaining a correct posture and strengthen the core stabilising muscles and back muscles safely and effectively, so that you can return to work and sporting activities as soon as possible. Facet Joint syndrome is pain arising directly from the facet joints. The facet joints are at either side of the intervertebral joints in your back. Their role is to prevent excessive movement, and provide stability for the spine. When the facet joints are functioning correctly they move freely to control the movement of the spine. What causes Facet Joint Syndrome? A fall and blow to the body sustained playing sport or as a result of a car-crash, for example, can put excessive pressure on the facet joints bringing about acute pain. Extending the spine or bending towards the affected side will exacerbate the pain in the facet joint. Pain in the facet joints can also be caused by sudden excessive movements that can have a great impact on the joint itself, or degeneration within the joint, resulting in the pain lasting longer than a few days. In the event of some kind of trauma there in an inflammatory reaction causing swelling in these joints which is a component factor in the joint pain. Pain can also be caused due to an impingement on a nerve within the joint. The main symptom of facet joint syndrome is pain just to one side of the spine and the spine will generally feel very stiff in the mornings. Often the muscles in the area of pain go into spasm. At Platinum Physiotherapy, we provide specialised assessment and treatment for people with facet joint pain. Physiotherapy treatment will reduce pain and stiffness by concentrating on improving range of movement and strength in the back. Structured exercise program to strengthen the back muscles and help to stabilise the spine. Physiotherapy will facilitate healing, promote recovery and get you moving better so that you can return to work, hobbies, and everyday tasks as soon as possible. Your physiotherapist at Platinum Physiotherapy will advise and support you through an individualised treatment program tailored to your lifestyle and hobbies to reduce pain, stiffness and improve strength and flexibility. Lumbago is a term describing general mid to lower back pain. 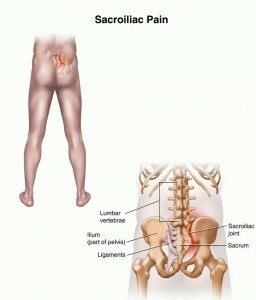 The exact causes of lumbago are unknown or rather its cause could be put down to a variety of things such as lifting objects that are too heavy and not lifting them in a proper way, overuse of the back, or as a result of some other condition you may be suffering from. A common cause of back ache is weak stomach muscles, which increases the stress on the back muscles. Several factors can contribute to back pain, like a sprain or spasm in a muscle or ligament, compression of the spine, or bulging or ruptured discs, all of which can put pressure on the nerves in the area. Back pain can also result from more serious disorders ranging from a trapped nerve to diabetes and cancer, and although it is often very difficult to determine the exact cause of back pain, some people may develop it for no apparent reason. Poor posture or an “S” shape in the spine. A person with lumbago will benefit from physiotherapy treatment. Treatment will reduce your pain and stiffness, increase muscle strength to help support your back and improve your posture to help return you to return to everyday and sporting activities as quickly and safely as possible. Your rehabilitation program will be tailored to you to ensure you get the most out of your treatment and continue to make improvements in the long term. Scoliosis is the most common deformity of the spine comprising two abnormalities of the spine; a lateral curvature meaning the spine bends from side to side creating an ‘S’ shape; and a rotation of the spine, which causes a twisting effect of the vertebral bodies. This deformity of the spine can often cause pain and fatigue but this depends on the degree of the curve. The cause of Scoliosis can point to various factors such as genetic, neuromuscular, hormonal or growth factors, though the cause is usually multi-factorial. In fact, the most common form of scoliosis is called “idiopathic scoliosis” which means that the cause is unknown, and furthermore it can affect people of different ages. The most common type of scoliosis is idiopathic adolescent scoliosis. There are cases however of congenital scoliosis that is an abnormality in the development of the vertebrae, and it is this failure of the spine to develop normally that causes scoliosis and sometimes deformity. Scoliosis can also be non-structural which means that a problem in another part of the body, like a discrepancy in leg length, can cause a curve in the spine or an imbalance in the muscles caused by one sided activities such as racket sports or something simpler like a child carrying a heavy bag on one shoulder all day at school. Often there is a muscle masses that causes a “hump” on one side of the body. The pain caused by the irregular shaping of the spine and the resulting muscular compensation can vary from being mild to acute, and often affects the area directly surrounding the spine itself. Often there is stiffness in the back and neck. Physiotherapy treatment can help to strengthen the supporting muscles of the spine and correct poor posture. Continual postural management including advice and adaptations. Mirror therapy is often used to increase awareness poor posture and correct it accordingly. Physiotherapy treatment will reduce pain and stiffness, increase muscle strength and improve your posture so you can continue with you everyday and sporting tasks to your maximum ability. 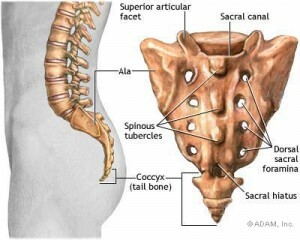 The spine is made up of the vertebrae that have cartilage discs between them. The discs consist of a circle of connective tissue with a central gel-like core. This makes the spine flexible and at the same time acts as a protective buffer. 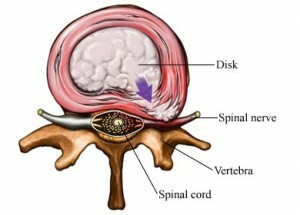 In the centre of this column of vertebrae and discs is the spinal canal, which contains the spinal cord stretching from the brain stem down to the first or second lumbar vertebra. It continues as a bundle of nerve fibers. Between each vertebra, the spinal cord has nerve root connections to other parts of the body. A slipped disc is the name given to prolapsed intervertebral discs that put pressure on the spinal cord and nerve root causing pain. The term is in fact misleading because an intervertebral disk is unable to slip or slide. Slipped discs most commonly occur in the lumbar spine, at the bottom of the back, between the fourth and fifth vertebra (L4/ L5). 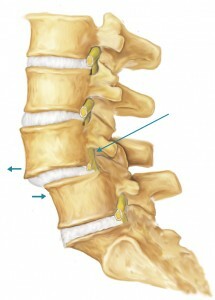 What causes a slipped disk? Repeated overuse of certain tasks, during bending, lifting, and sporting activities can cause a slipped disk. Usually there is one offending movement that will be the catalyst for a prolapse to occur. Overuse of certain spinal disks in the back can lead to degeneration of the outer layer of the intervertebral disc and, if this degeneration is sufficient, the gel-like nucleus material is liable to prolapse out of the disc. If the prolapse is pressing on the nerve root this will cause you pain. Other causes include stress fractures and also genetics may also play a part in the probability of a slipped disk occurring. What are the Symptoms of a slipped disk? Onset of sudden and severe pain in the back made worse by flexed positions such as sitting. Often the prolapse direction means that pressure is put on the sciatic nerve which produces pain in the buttock, hamstrings, the back of the knees, the calf or the heel. Sometimes symptoms may include numbness and loss of motor control over the leg. At Platinum Physiotherapy, we provide specialised assessment and treatment for children and adults with spondylolisthesis. An exercise program will also be developed and tailored to your symptoms and current level of activity to ensure you keep your back strong and flexible but don’t do any more damage. Physiotherapy treatment will be focused on reducing pain, improving posture, increasing strength of the muscles to help stabilise your back and getting you back to your everyday activities and hobbies with confidence and success as soon as possible. 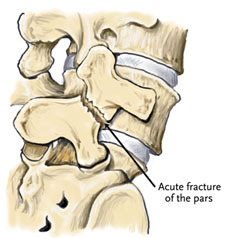 Spondylolysis is a stress fracture of the pars interarticulari, a bone that connects the upper and lower segments of the facet joints in your spine allowing movement. It often occurs in young athletes involved in sports that require hyperextension and rotation. What is the cause of Spondylolysis? Spondylolysis is caused by weakness of the pars interarticularis. The exact cause of the weakness of the pars interarticularis is unknown. One cause may be overuse and that repetitive trauma to the lower back can weaken the pars interarticularis. This commonly occurs in sports requiring repetitive movement such as gymnastics, weight lifting, athletics, and football. Another cause points to genetics (heredity) as a factor, suggesting that some people are born with thin vertebrae, which places them at higher risk of spondylolysis. The fracture usually occurs on the side opposite to the one performing the activity i.e. left-sided fractures in right-handed tennis players. What are the symptoms/effects of Spondylolysis? The patient will complain of unilateral low back ache occasionally associated with buttock pain. The pain is aggravates by movements involving extension. Diagnosis of Spondylolysis can be made by a physiotherapist or doctor after conducting a thorough subjective history and physical examination. An X-ray be required to help to confirm a diagnosis. At Platinum Physiotherapy we provide comprehensive assessment and treatment for people with spondylolysis. Early diagnosis and rehabilitation is essential in this type of injury for the best possible recovery. Strengthening the abdominal and back extensor muscles once pain free range of movement has been achieved. Your rehabilitation program will be structured so that you progress safely and effectively and eventually return to the activities you enjoy to the best of your ability. Coccydynia is pain in the area of the coccyx or tailbone and can be anything from discomfort to acute pain, which is aggravated by sitting down. Coccydynia occurs when your coccyx, or the surrounding tissue, becomes damaged and can be caused by many different factors. Childbirth. This can cause the muscles and ligaments to overstretch around your coccyx compromising the stability of the coccyx bone. Direct injury. This can occur when you fall on the base of your spine when skiing, gymnastics or horse riding. Repetitive strain injury. Repetitive movement such as leaning forward and stretching the base of your spine in sports such as cycling or rowing can cause coccydynia. What are the symptoms/effects of coccydynia? The main symptom of coccydynia is pain and discomfort at the base of your spine, where the coccyx is located which is usually made worse when you are sitting. The severity of the pain varies from person to person, and it can get worse as time passes. Coccydynia can have a significant impact on everyday activities such as sitting, driving and bending over. A physiotherapist or a doctor will take a detailed history and conduct a thorough physical examination to confirm a diagnosis. Physiotherapy treatment will help to reduce your pain and get you back to your everyday tasks with ease and confidence as soon as possible. Your physiotherapist at Platinum Physiotherapy will ease painful symptoms by stretching and manipulating the muscles around your coccyx. This will help to relieve pain and discomfort, particularly if your coccyx has been displaced from its normal position. Your physiotherapist will develop a graduated rehabilitation program tailored to you, which will facilitate healing and return to everyday and sporting activities in a safe an effective way. What is a gluteal strain? A gluteal strain is when one of the muscles in your buttocks is stretched or torn causing pain and stiffness. What causes a gluteal strain? A gluteal strain is commonly caused by running or jumping in sports such as hurdling or dancing. What are the symptoms/effects of a gluteal strain? At Platinum Physiotherapy we provide individualised assessment and treatment for people with gluteal strains. The goal of physiotherapy is to return you to your sport and everyday activities as soon as is safely possible. If you return too soon you may worsen your injury, which could cause more damage. Return to you sport or activity will be determined by how soon the injury area recovers not by how many days or weeks it has been since your injury occurred. It is important to commence physiotherapy treatment as soon as possible to hasten your recovery and get you back to your activities sooner. What is hamstring origin tendonitis? Hamstring origin tendonitis is a condition characterised by inflammation and damage to the hamstring tendon where is attaches to the pelvis, causing pain in the buttock. Hamstring origin tendonitis most commonly occurs due to repetitive or prolonged activities placing strain on the hamstring tendon, such as running, jumping or kicking activities. Hamstring origin tendonitis may also occur suddenly due to a high force going through the hamstring tendon beyond what it can withstand, such as rapid acceleration in sprinting and football. 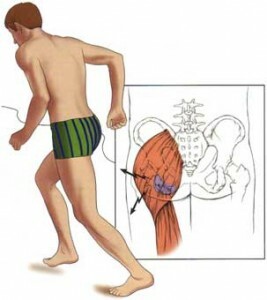 The most common symptom of hamstring origin tendonitis is pain in the lower buttock. People may also experience an ache or stiffness in the buttock that is made worse by activity such as running, jumping or kicking. A person with hamstring tendonitis will benefit from physiotherapy treatment. Physiotherapy will initially assess your current symptoms, range of movement and muscle strength in order to develop an appropriate treatment programme for you and your lifestyle. Exercises to improve strength, flexibility and core stability. A gradual return to activity program specific to your sports. This may include a running program comprising of progressive acceleration and deceleration running drills. Physiotherapy treatment is vital to hasten the healing process, promote recovery and ensure you get back to you sporting activities in the most effective way. Ischiogluteal bursitis is inflammation to the ischiogluteal bursa at the base of the pelvis, causing pain and reduced activity. 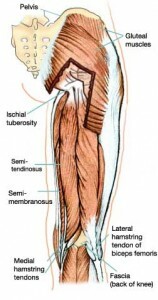 The ischiogluteal bursa is a small sac filled with lubricating fluid to reduce friction between adjacent soft tissue layer and lies between the hamstring tendon and the pelvis. Ischiogluteal bursitis is commonly caused by repetitive or prolonged activities placing strain on the ischiogluteal bursa such as prolonged sitting or repetitive running, jumping or kicking activities. Ischiogluteal bursitis can also be caused by direct trauma such as a fall on a hard surface. What are the symptoms/effects of Ischiogluteal bursitis? The main symptom of ischiogluteal bursitis is pain in the lower buttock. This pain is often aggravated by sitting for long periods walking, running, jumping, kicking or climbing stairs. Diagnosis of ischiogluteal bursitis can be made by a physiotherapist or doctor following a thorough subjective and objective examination. Physiotherapy treatment should commence as soon as possible for a speedy recovery and return to sporting and everyday activities. Physiotherapy will reduce pain and increase muscle strength and flexibility of the surrounding muscles to ensure an optimal outcome. Physiotherapy treatment at Platinum Physiotherapy will significantly decrease your recovery time and prevent the likelihood of it happening again. Your physiotherapist will support you through a progressive treatment program and advise you which exercises are most appropriate for you for the best possible recovery and success in the long term. The piriformis muscle is a tiny muscle running from the base of your spine to the top of the thighbone that is deep inside the buttock and rotates the leg outwards. The sciatic nerve runs very close to this muscle and in some cases may even run through it. Piriformis syndrome is when the piriformis muscle becomes tight and therefore inadvertently puts pressure on the sciatic nerve. The disorder therefore causes pain and tingling and numbness in the buttocks in the area in which the sciatic nerve exists. Piriformis Syndrome is most commonly caused by other muscles being tight or not working sufficiently and therefore putting more strain on the piriformis. Muscle imbalances (meaning one muscle being more powerful than the other causing a tug of war effect) pull the hip joints and pelvis out of place and this changes this position alteration often tightens the piriformis muscle which in turn places pressure on the nerve. Symptoms of piriformis syndrome include pain in the buttocks that may radiate down the leg. It can often be mistaken for sciatica. People with piriformis syndrome do well with appropriate physiotherapy. 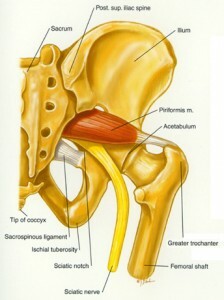 This often involves massage and stretches to the piriformis muscle. A graduated flexibility and strengthening program guided one of our physiotherapists at Platinum Physiotherapy will accelerate healing and recondition the piriformis muscle. This is essential to reduce the likelihood of injury recurrence. Soft tissue massage to relieve tight muscles and to reduce compression of the sciatic nerve. Careful assessment by your physiotherapist will determine which factors have contributed to the development of the condition, and treatment will be tailored around this to ensure you make the best possible recovery. Pain felt in the buttocks is commonly referred from the lower back. There does not necessarily have to be pain in the lower back as well for pain to be referred into the buttocks. Problems in the lower back such as disc prolapse, spondylolysis and spondylolysthesis may refer pain to the buttocks. The physiotherapists at Platinum Physiotherapy commonly assess and treat people with referred pain. Exercise programme that will stretch and strengthen the muscles supporting the lumbar spine and the muscles in your buttocks and hip. Physiotherapy treatment will help to relieve your pain so you can get back to everyday activities with confidence and success. The sacroiliac joints sit between the sacrum and the ilia, at the back of the pelvis, and there are several dysfunctions that can exist in this area causing pain. Sacroiliac Joint Dysfunction is an abnormality in the mechanics of the joint, which puts abnormal pressures on the joint surfaces, ligaments and surrounding muscles, causing pain. There are many different possible causes of the dysfunction due to the many different twisting forces applied to that area when moving the legs. Direct trauma such as a fall or a car crash. Mechanical imbalance, like a discrepancy in leg length. Hormones released during pregnancy allow ligaments holding the SI joints together to relax causing increased movement in the joints and can lead to increased stresses and abnormal wear. What are the symptoms/effects of Sacroiliac Joint Dysfunction? Sacroiliac Joint Dysfunction typically causes a dull aching pain at the base of the spine. The pain can vary from an ache to being sharp in nature with certain movements such as bending, lifting or rolling over in bed. Sometimes there is referred pain in the groin, buttock or the back of the thigh, but this referred pain will rarely go below the knee. A thorough history and physical examination by a doctor or physiotherapist will confirm a diagnosis of Sacroiliac Joint dysfunction. A person with Sacroiliac Joint Dysfunction will benefit from physiotherapy treatment. Pain in the SI joint is often related to either too much movement or not enough movement in the joint. An initial assessment with one of our experienced physiotherapist will identify the underlying cause of your pain and a treatment plan will then be developed accordingly. Your physiotherapist at Platinum Physiotherapy will use hands-on techniques and teach you various exercises to reduce the pain and get you back to your everyday activities as quickly and as safely as possible. You will be supported throughout your rehabilitation program to ensure you make the best possible recovery.